There is a need to explore how we create a new framework for equality and diversity in terms of gender, sexuality, ethnicity and language. New insights are also required pertaining to tech giants and fake news, algorithms, surveillance and “the robots are coming”. What’s more, inequality is one of the biggest topics on the global agenda. CBS’ Business in Society strategy spearheads research that contributes with critical, constructive insight into major agendas – including issues that are among the UN’s Sustainable Development Goals – so that we through dialogue and collaboration between research, companies, the public and society can point to new pathways and solutions on the way forward. With the establishment of three new research platforms over the course of five years, CBS aims to join in the debate with a strong, knowledgeable voice when these topics arise. The Inequality platform addresses the causes and consequences of inequality in a globalized world, from a Danish, European, and global level and in its multiple and closely linked dimensions. - Inequality is one of today’s biggest challenges, globally and locally. The platform’s main task is to study the causes and consequences of inequality – why it is on the rise in many countries, and what the implications are for people and companies nationally and internationally, explains Professor (with special responsibilities) Mogens Kamp Justesen, one of the Inequality platform’s academic directors . - The purpose of our research is to ask relevant questions that help us as a society to find new answers and solutions in close collaboration with policy makers, companies, organisations and society. By virtue of our area of research, our natural partners are organisations such as ministries, the Confederation of Danish Industry, CEPOS and Cevea, but we would very much like to collaborate with larger Danish companies interested in contributing, says Associate Professor Birthe Larsen, the platform’s other academic director. The platform held its solo launch on Tuesday 2 October, featuring prize-winning economist Professor Richard Blundell and interactive artwork. The Diversity and Difference-platform focuses on diversity and difference – culture, ethnicity, sexuality, language – with an aim to enable inclusion and equality, actively working with organisations on diversity management. - Inclusion and equality are urgent agendas in our globalised world and are also among the UN’s Sustainable Development Goals. We want to explore how we can best promote inclusion and equality in relation to gender, ethnicity, language and culture. We would also like to contribute to the public debate and disseminate our research widely, states Associate Professor Dorte Lønsmann, one of the platform’s two academic directors. - Because our approach to the platform is interaction-oriented and transformative and involves collaborating with the business community, organisations and society to create concrete tools, we’re interested in working with organisations and larger businesses that have diversity prominently on their organisational agenda, preferably at a strategic level. Among our current collaborators, I can name Danish Defence as a good example, says Professor (with special responsibilities) Sara Louise Muhr, the platform’s other academic director. The platform held its own launch on Thursday 11 October with the award winning feminist communication scholar Professor Karen Ashcraft as keynote speaker, concept exhibits and live music by a feminist underground band. The Transformations-platform ‘Technology, data and knowledge in the digital age’ explores the implications of digital and other technological developments for economic and societal transformations. - The internet has become a global infrastructure, and our lives are inseparably linked with digital technology – but it’s market-driven and non-transparent in terms of, for instance, human rights and democracy. Our platform will help create critical international knowledge to point out new pathways, advise decision makers and contribute to the public debate, clarifies Professor with special responsibilities Mikkel Flyverbom, one of the platform’s two academic directors. - We would like to enter into a dialogue and collaborate with tech companies taking advantage of digital development opportunities and creating value, as well as with organisations and companies that must meet the demands of the transformations in order to remain competitive, emphasises Professor (with special responsibilities) Ioanna Constantiou, the platform’s other academic director. The transformations-platform’s unveiling will be at the joint platform-launch on 12 November, when you’ll have the opportunity to hear more about its focus area ‘Technology, data and knowledge in the digital age’. At the joint launch on 12 November, the three research platforms will demonstrate how cross-disciplinary research initiatives can enrich the public debate and help solve these societal problems. 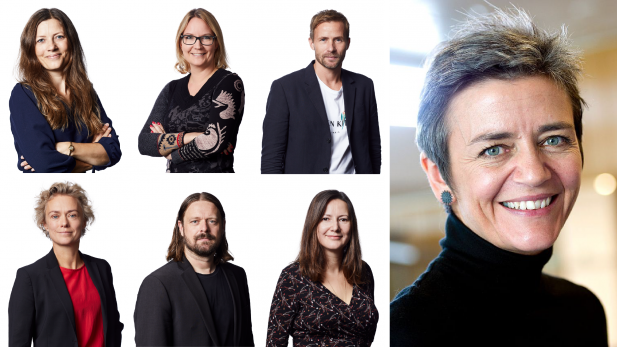 So will EU’s Competition Commissioner Margrethe Vestager, who in her keynote address the will explore the intersections between inequality, diversity and technology in a digital age. The launch will, of course, include a presentation on the research area of each platform by Associate Professor Larsen, Professor Flyverbom and Professor Muhr, as well as three case presentations on the intersection between the platforms’ focus areas, allowing companies, think tanks and startups to enter into a dialogue with the CBS researchers affiliated with the platforms. The launch will also incorporate art by presenting two new media exhibits. Artist Mogens Jacobsen will be present with the works “The Voice Pump” and “The OECD Lab”, which will interactively provide a new perspective on the themes of inequality and diversity with new media itself as an exponent of transformations.